Luna and Kevin live between the US and Canada but wanted their wedding to include Chinese and Western elements. They hadn’t been to Greece before despite having always wanted to visit this wonderful part of the world so their first visit to Santorini was definitely one of the most memorable and life-changing trips you could imagine! Now I love my role as a wedding photographer in Greece and it’s also a thrill to be part of such an intimate gathering. Twenty-three guests flew into the Greek Islands for Luna and Kevin’s wedding and it was such a treat getting to know everyone and being part of such a fabulous occasion. 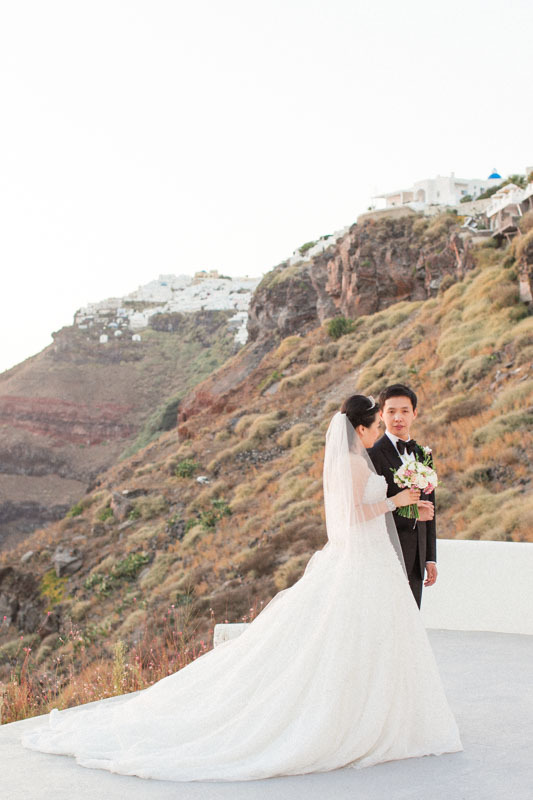 The couple worked with Santorini wedding planners, Stella & Moscha (who are always in demand!) and talented florist Fabio Zardi was commissioned to provide delightful floral arrangements and installations for the ceremony and reception at the Sun Rocks Hotel. Luna began her day with bridal preparations and Renia Bledaki and Georgia Theodoraki were on hand to take care of Luna’s classic bridal hair and make-up. She looked absolutely stunning and her Kleinfeld Bridal ceremony dress and exquisite sparkling Rene Caovilla wedding shoes completed her look perfectly. Once Luna was ready, it was time for the ‘first look’. This American wedding tradition is becoming more and more popular in the UK and at destination weddings and I love capturing the expressions on the bride and groom’s faces when they see each other for the first time. As you’ll see, Luna and Kevin’s first look was a very special moment indeed. Fabio Zardi had transformed the venue, working with a white, light pink, gold and silver colour palette. This is absolutely perfect for a classic and romantic wedding and as an experienced wedding photographer in the Greek islands I have to say it looked so charming. There were roses, freesias and delphiniums to name but a few plus hypericum berries and live leaves to highlight the colour palette. The wedding ceremony itself took place at sunset, facing the caldera, which is the most breathtaking backdrop you can imagine and once the couple had said their vows, we walked through the village of Firostefani for some unforgettable couple’s portraits. Back at the Sun Rocks Hotel, whilst Luna was changing into her gorgeous second dress ahead of the evening reception, I organised a surprise for the newlyweds – an entrance into the reception surrounded by sparklers and their friends and family. It was a great part of the day and provided another excellent opportunity for some more photographs! Kevin and Luna danced into the night, under the stars and surrounded by the people that mean the most to them in the whole world. It was such a privilege to be their Greek wedding photographer and I can’t wait for my next intimate wedding in Santorini. If you’d like to see more of my work in Santorini and the Greek Islands, do take a look at this pre-wedding shoot in Santorini and also my own romantic getaway to the heavenly Greek island of Folegrandos. If you need more Santorini beauty, you will not want to miss this romantic getaway to Santorini at the gorgeous Kirini Suites & Spa Hotel and at the Chromata Hotel, two of the best most breathtaking hotels in Greece! I would be thrilled to photograph your wedding, engagement and elopement in Greece! As a destination wedding photographer, I’m used to working on weddings of all sizes and I really enjoy intimate weddings where I can really get to know you and your guests. Please contact me for more information on read more about my wedding photography services and packages. You can also take a look at my wedding portfolio here! I will be in Greece next summer and I’m available for weddings and photoshoots so please get in touch if you’d like to know more. In the meantime, why not keep in touch on Facebook, Twitter, Instagram, Pinterest or Google+? Photography: Roberta Facchini | Wedding Planner: Stella & Moscha | Floral Design & Decorations: Fabio Zardi | Make-Up: Renia Bledaki | Hair Stylist: Georgia Theodoraki | Bride’s Dress: Kleinfeld Bridal | Bride’s Shoes: Rene Caovilla | Video: Aegean Films | Venue: Sun Rocks Hotel | Brides Rings & Jewellery: Tiffany & Co.